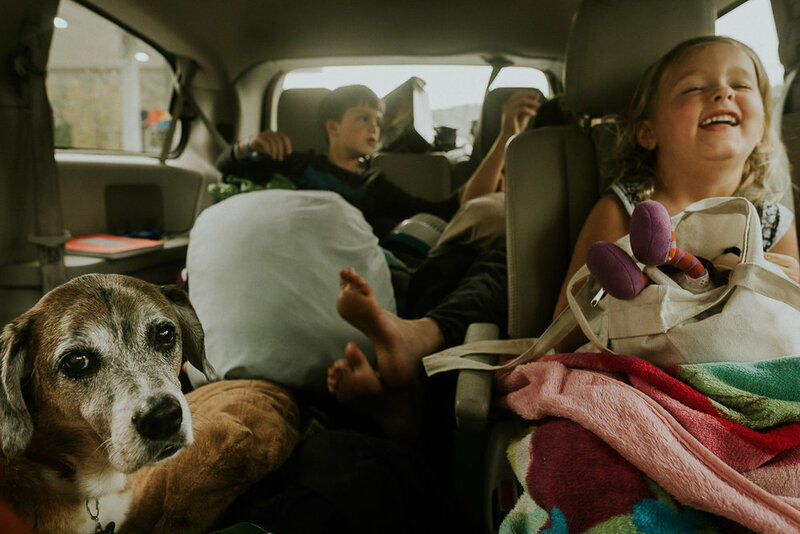 Road tripping- capturing the journey of childhood during a family trip. As a kid I can remember the long road trips my family often made from Poughkeepsie NY to Rochester NY. There was always a sense of excitement jumping into the car after a week of anticipation. I couldn’t wait to see to all of my cousins, aunts, uncles and grandparents. My parent’s and my extended family all lived in Rochester, my mom and dad moved to Poughkeepsie after my Dad got a job at IBM there. To me going back to Rochester felt like going back home. The car ride up was always so much fun as I remember it. Perhaps my parents would disagree. I would sit in the back seat of our Chrysler K car, sandwiched in-between my brother and sister while my Dad blasted a mix of Supertramp, Led Zeppelin or some other class rock. The dashboard sticker on my moms side read “I’d rather be in Rochester” the whole car was excited to be back with family. I remember starring out the car window on these road trips, especially as the sun was setting and the car grew quiet. I would gaze out as the other cars passed by, with their bright headlights, colors of white and read. The glowing green signs. The city lights. It was rather enchanting to a little kid of 8 years old. The car ride seemed so long towards the end, often times rolling up to my Grandparents house late at night. Walking up and climbing out of the car at my Grandma and Grandpa’s house, them greeting us at the door, sometimes in their nightgowns. Now that they are gone and their house has been sold these memories seem particularly special, etched forever in my young mind. I don’t have any photos from my road trips as a kid…I sure wish I did. Maybe that’s why when we make the trip up north to see family I feel the need to document it. My husband’s family is also from NY and we travel frequently there to visit. The ride is even longer than it was in my youth- about a 10 hour drive from Raleigh NC. The kids are older now so there is a lot of playing in the back of the car as well as the fights and us telling the kids to stop fighting. There’s the snacking, the movie watching, and the frequent stops that are made when you have 3 kids under 10 years old. And then there’s our old pooch Sammy who at 12 years old is a seasoned traveler, he’s often times buried in a pile of kid debris…toys, blankets and pillows, his little snout peeking out eagerly waiting for a treat to fall from one of the kids hands. Similar to my childhood car trips; we do not travel in style. Our 2013 Town and Country is packed to the brim with suitcases, fishing poles, boxes of food and pillows. There is not an inch of space to be spared. Finger prints decorate each and every one of the back windows, the sun setting illuminates them reminding me of this brief time in our lives. I look at those finger prints and feel happy and content as we make our way back to what will always feel like home- New York.